You want a great website, right? Here is what you are up against. There are about 1 billion, yes that’s Billion, websites in the world. Most sites never reach success. I want you to be among the small percentage of entrepreneurs with an exceptionally successful website. Although the title of this article says “website”, we also mean “blogs” when we talk about websites. If you are interested in making money with a blog, check out my step-by-step guide on how to start a blog. 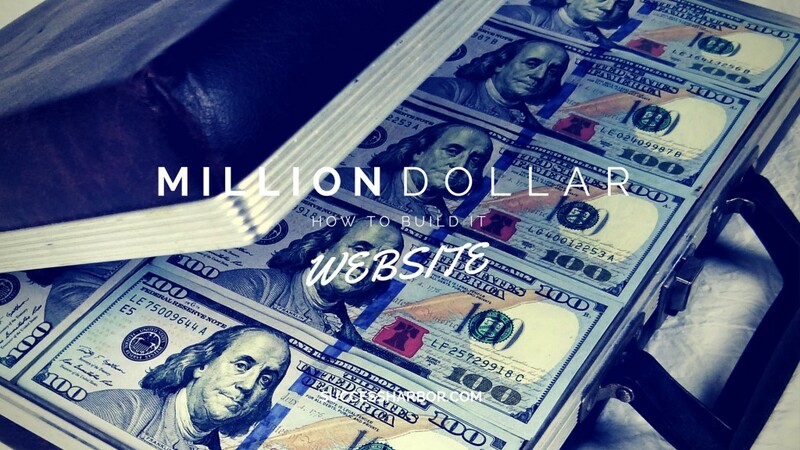 In the following article, I will show you how to build a million dollar website. Each website has a lot of moving parts. If your goal is to have an above average website, you have to work extra hard. There are many mistakes you can make along the way before you start building it. If you make those mistakes, it will negatively impact your website forever. Most websites underperform because mistakes are made before and during website creation. They might seem like small mistakes, but they add up. The result is a website that disappoints. Follow the steps below to avoid some of the biggest website mistakes. Why are you building a website? Duh, right? No, not really. Entrepreneurs often build websites without thinking through the reasons. Ask yourself: What do you want your website to do? What is the end result? You don’t just have to make a decision between e-commerce and non-e-commerce. What is the purpose of your website? – Information, brochure, blog, e-commerce, lead generation. Can you better your competition? – By the time your website goes online, you will be competing against thousands. If you want to beat them, you must outdo them. You can’t just have a website that is “as good” as their site. Your site has to be much much better. How will you make your content awesome? – Nothing makes a website more successful than its content. Most websites have boring, brochure-like information. To get noticed among the 1 billion websites, your content must be great. Your content shouldn’t be about you or what’s important to you. Instead, focus on your audience. What’s important to them? What keeps them up at night? How will you market your website? – Your website without marketing is going to get lost among the millions of websites. If you want to stand out, you have to have a solid website marketing strategy. Search Engine Optimization (SEO) is the name of the game. One of the most effective ways to do SEO today is through content marketing. What do you want people to do? – Once you get a visitor to your site you are only halfway there. Now, it is time to get people to take action. Do you want them to buy, call, complete a form, download something? Whatever it is you want people to do, you have to spell it out. Don’t assume that “people know what to do”. Online brochure – Building credibility is the most important part of a brochure website. Many attorneys and professional service providers have brochure websites. Think about what you will include building credibility. Lead generator – Unlike a brochure website, a lead gen site’s purpose if to drive more business. When people find your website you want them to take action such as call, complete a form, email, or contact you in some way. E-commerce – What are you going to sell? Are you going to have an inventory or will you dropship products? Do you have a merchant account to take credit card payment? Which shipping company are you going to use and why? How are you going to have images for your products? Are you going take the photos or are you going to hire a professional photographer? Blog – What are you going to blog about? Is your niche big enough for a large readership? If your goal is to make money with your blog, how are you going to monetize it? Which blogging platform are you going to use? Do you want to use your own hosting company with a WordPress blog or free hosted platform? Review – There are thousands of successful review sites. Many of them make a lot of money through affiliate marketing. For example, if you ever looked at a website hosting review site, it was most likely an affiliate site. Forum – Forums are a great way to build a community. If you can find a niche that is currently underserved, you might be able to build a successful form. Directory – Niche directory sites are popular. The difficult part is finding the right niche. A combination of the above – Most websites are a combination of the above. Before you start building, consider what you want to have in your own website. How to register the best possible domain name? Do you ever wish you had another name? To register a domain is easy. Finding the right domain is difficult, but it’s worth it. The right domain name can be a real asset for your business, so take it seriously. The best domains are short, memorable, and easy to spell, but there is more to it. Although there are so many new domain extension to choose from, I still think that the .com is the best for business. If you think there are no more good .com domains available, think again. There are still millions of .com domain names for you to choose from. Get your creative juices flowing. Brainstorm possible names based on your products or services. Also, include the location you are serving. Combine multiple words. The combination of two or three words could make for a great domain name. Use tools like unique-names.com and Dotomator.com. Search for expired domain names on sites like Justdropped.com. I have found some really awesome domain names this way. Check out domain name auctions. Both Flippa and Godaddy have domain name auctions running all the time. Is your domain name unique? Remember that your domain name is part of your brand and you want it to be memorable. Does the name stick with you? Don’t settle for a name that is not memorable. Isyourdomainnameshortorlonglikethis? The greatest brand names are short, think Apple, Google, IBM, Twitter. Keep your domain short. Does your domain name describe your business in any way? There has to be a connection between your domain and your business. Find a host for your website. Find a good home for your website by choosing a reliable hosting company. There are so many options for hosting that it is easy to get overwhelmed. Over the years I have used dozens of hosting companies. Currently, my websites are hosted by two hosting companies, A2Hosting and SiteGround. I like them both for different reasons. How long has the hosting company been in business? You don’t want to be the first customer of a hosting company. What kind of reputation does the company have? Any company can have some negative reviews. That it in itself doesn’t rule out the hosting company, but if you see a lot of complaints, move on to the next. Contact the support of the hosting company before you sign up. See how long it takes to get through. Also, consider how you are treated. How long did you have to wait on hold? Does the company even have phone support? I prefer hosting companies with phone support. Consider price, but not just price. There are many dirt cheap hosts out there. Saving a few dollars a month isn’t worth losing thousands. A cheap host sounds great until you run into problems with performance, reliability, malware, and support. Is the admin interface easy to use? Check out the admin area before you sign up to make sure it is intuitive. Location of the servers. If your customers are located in the USA, don’t host your site on a server in Europe. The better hosting companies have servers on multiple continents. Specialization. If you run a WordPress website, see if the host is optimized for the platform. What do you get as part of the package? How many sites can you have in one account? How much storage, bandwidth is allocated? Do they offer a one-click installation of the most popular platforms like WordPress? What kind of hardware do they use? Do they have solid state drives or do they still use old school hard drives? Is email included in the package? It’s hard to believe, but there are hosting companies that exclude email. Scalability. Once I signed up with one of the largest hosting companies and a few days later they told me that I needed to pay more now. Bait and switch happen in the hosting world. Needless to say that I have moved my site. I don’t want to do business with companies like that. The website platform you choose will have an impact on everything. Which platform you build your site on will impact everything from content creation to SEO to reliability. I have used many platforms in the past and I have never found one that I like more than WordPress. There is no more dominant platform in the world than WordPress. About 23% of all websites in the world use the WordPress platform. Brand names like CNN, UPS, NBC Sports, just to mention a few, use WordPress. WordPress is an open-source free platform. There are thousands of volunteers – coders and designers – around the world who constantly improve WordPress. Many website hosts offer a one-click WordPress install. That means that your website could be live within minutes, and you don’t have to be a geek to make it work. You can install free or inexpensive themes, to make your site look polished. There are thousands of plugins that add additional features to your website. Do you want better SEO? There is a plugin for that. Do you want a better editor? There is a plugin for that. You get the picture. Even though WordPress is a fairly easy platform, it does require some learning on your part. Use a secure hosting company. Make sure you find a website host that works well with WordPress. I really like SiteGround to host my WordPress site. Set up your website correctly. One of the greatest advantages of WordPress is the thousands of plugins ready available to you. Wordfence Security – Wordfence helps to keep your website secure. It protects your site from hacks and malware. Contact Form 7 – This plugin makes form creation easy. Yoast SEO – A great plugin to improve your website’s SEO. WooCommerce – If you want to sell on your website, use WooCommerce. Do you want to make your website faster? First, you need to start with a great website host. In addition, use WP Super Cache or W3 Total Cache. Google XML Sitemaps – Help the search engines crawl your entire site with this plugin. Jetpack – This is a collection of useful utilities. Content is what differentiates great websites. Unfortunately, most websites have too little content. And, the little content they have is not very good either. Developing excellent content is hard. It takes planning, work, and promotion. Determine who is your audience. What is important to your audience? Don’t confuse this with what’s important to you. Brainstorm ideas. Make a list of relevant content for your audience. List possible content types from articles to videos, to images to audio, etc. Publishing calendar. How frequently will you post new content? You have to stick to a specific schedule with actual dates and deadlines. Create original thought-provoking content. Don’t copy, but…study what’s out there. Your goal is to find similar content and create superior content. What are the most frequently asked questions among your customers? Start creating content by answering those questions. Create strong headlines. Your headline is the most important part of your content. If you have a weak headline people won’t read your content. Whenever possible include call to action within your content. Your content should not be about you. Great content is about solving your customers’ problems. Base your content on hard facts. Show your sources. Don’t be afraid to link to other articles, websites, or blogs. Use stories. Share success and failures. Write reviews. You can review books, apps, products, etc. Get ideas from books, the news, movies, etc. Invite guests to create content. I have never seen a great website without good images. Freeimages.com – At the time of writing this article they claim to have 388,125 free photos and illustrations. Flickr.com – Not everyone allows their photos to be used commercially. Use advanced search to find “Creative Commons-licensed content”. I also like to use Canva to create my own images. Optimize your site for the search engines. Earlier I have mentioned the Yoast SEO plugin. It is a great tool to SEO your content. You can customize the page title and meta description of each of your pages. Yoast SEO automatically tests the important areas of your content. It can help you create your XML sitemap. The plugin makes editing your robots.txt and .htaccess files easy. Link to your social network accounts. No website or blog marketing strategy is complete without social media. If you are ignoring social media, you are ignoring your prospects and customers. There are many social media tools and plugins that help you connect your website to your social media accounts. Jetpack – Sharing – Jetpack comes with a lot of great utilities. Sharing is its social sharing feature. The simple truth is that your website will fail without promotion. 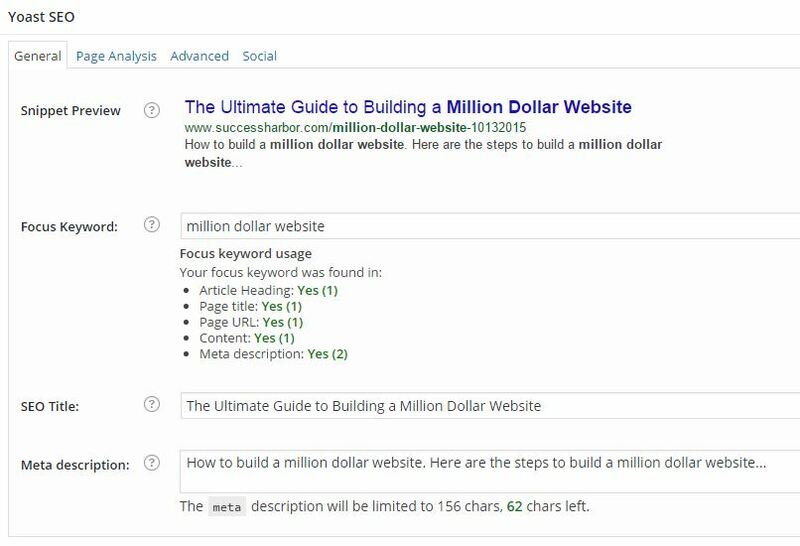 Before you create your content, determine which keyword phrase you are targeting. Guest blog – When you write for other blogs and websites you get access to new audiences. You also get a link back to your own website from the byline. 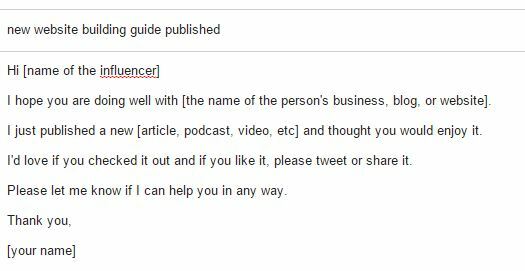 Ask an influencer for a quote. Reach out to influencers within your industry and ask if they would be willing to give you their point of view. Twitter is a great tool to reach out and connect with influencers. If you need immediate traffic, try pay-per-click (PPC) advertising. Especially, if your site is brand new and you don’t yet have any organic traffic, this is a great way to get started. Retargeting – It works by placing a tracking cookie on your visitors’ computers. Then, after they leave your website, they continue to see your ads. Press releases – You can write your own press releases. There are free press release distribution services like prlog.org or paid ones like pr.com. Include your URL within your email signature. Break your content into 10-20 snippets, then share them throughout your social network. Share your content several times. After you post your content, share it in the following days, weeks, and months. A great tool to make sharing easier over time is “Revive Old Post”. Mention experts, influencers, tools, and brands when sharing. Email your sources, and your network when you publish new content. Direct message influencers through LinkedIn, to give them a chance to share your content. Contact people who shared similar content. A great way to find such people is during your research. Use tools like Open Site Explorer to find sites that have linked to similar content, and reach out to them. Promote your content through the StumbleUpon paid discovery service. Repurpose your content to appeal to a new audience. For example, take your most popular posts and convert them into videos or vice-versa. Or, create slides based on your most popular blog posts. Then, post your presentations on SlideShare. Turn your content into pdf and use it as an email subscription giveaway. Submit your content to content communities like Triberr or BizSugar. Promote your content through Outbrain ads. Turn your content into a magazine with Flipboard. Become part of the conversation on forums like Quora or Reddit. Answer questions related to your content, then link back to a relevant content on your site. Submit your site to directories like DMOZ. Do article marketing where you post your content to article directories like ezinearticles.com, goarticles.com, or articledashboard.com. If you sell a product, start an affiliate program. Create an iPhone or Android app. Purchase misspelled domains and forward them to your site. Partner with other websites and cross promote. Start your own networking group.